Verticle Leap Interactive Marketing > Blog > Adwords > Paid Search vs. SEO Which Channel is Right for You? 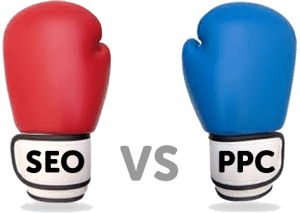 If you ever feel the need to make a choice between putting your marketing dollars in either a paid search (PPC) campaign such as Google AdWords or starting the process of establishing SEO as a channel choice, you may find it difficult to select one or the other. The reasons for this are many. Since each channel complements the other and adds value to the other, separating them is not ideal. In this post, we will cover some of the strengths of each channel and what you can expect from each – from a cost and time perspective. Relevance refers specifically to the keywords that are used by a search engine visitor to find a particular product or service. Your own keywords, your ad copy and your landing page should all closely echo the keywords used by the search engine visitor. If any of these falls short, you can expect to pay more if you are able to find your way into search results for a similar or appropriate match. Exact matches are best. Close matches will almost always cost more. Paid search and other PPC channels are essential for the future advertising of most businesses. The reasons are largely bound to reach. Without paid search or PPC, the reach of many advertisers is incredibly limited. 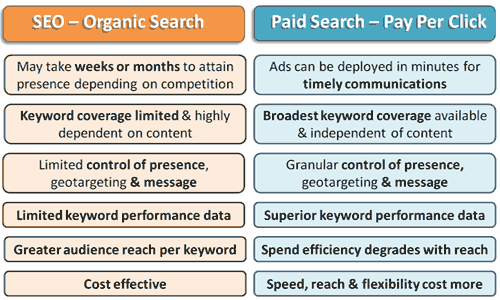 PPC offers stability, where many channels cannot. It does not come without a price, however. To succeed, it is a price that businesses will necessarily pay, and it can be a price well worth the returns. If you aren’t advertising in the PPC channels, you are likely missing a significant opportunity to gain market share. Many folks I’ve encountered over the years express that paid search, for instance doesn’t work for them. They have essentially given up on the channel due to bad experiences with agencies and managers who failed to generate returns. Many of these businesses can actually succeed in paid search. Some of the kinds of businesses that may fail with paid search are those with low-cost and/or low-margin products. If a business is predominantly selling these types of products, chances are, paid search won’t work out so well. Product inventories, will require some level of price variance in order to use paid search effectively, in many cases. However, if such products are typically sold in high volumes or sufficiently viable volumes, paid search is still a possible revenue generating channel option. Other situations that will improve chances of failure in paid search include, products that are hard to ship or require costly shipping fees, such as items that have to be kept at particular temperatures or those that can only be shipped during certain times, such as weekdays. Complications such as these can eat into margins and also be unsavory to buyers that will have to pay for the shipping needs required by various products. One example is a cake maker that may only be able to ship Monday-Wednesday to insure the delivery is kept at a fitting temperature. Another might be an accessory seller with only low-cost accessories in the product inventory (in this case all products costing under $15). It’s difficult to make paid search work when margins are razor thin, because the margin require for paid search clicks will quickly eat away at the margins, and preclude profit. One notion to keep in mind is that PPC doesn’t have to be about profit or short-term ROI. It can be incredibly effective for the long-term value of branding. Keeping your brand in front of an ideal audience has the effective of strengthening your presence and consumer sentiment when campaigns are executed with aplomb. A strong online brand can translate to greater in-store selling power in that consumers will often arrive informed and with greater interest in what you sell. This can save time in the sales process and in many cases will make for happier consumers, who know how to get the most out of the products they buy. Teaching your customers how to use your products will always be a benefit to your long-term marketing efforts. And, the exposure you can gain through PPC can provide the gateway to education and general inducement power. I have yet to come across an industry where I could not find search data to support activity that would merit running paid search campaigns. Whether service or product, B2B, B2C or any business that sells or services, paid search and PPC can be great complements to a marketing strategy. I have, however run across several companies that were not ready to enter the realm of PPC, in terms of maximizing their campaigns. Some reasons for this include, not having the technical staff to implement code or the ability to access the code in a manner suitable to carry out tasks such as testing or including tracking code or ecommerce code such as that used in Google Analytics. Some companies simply price themselves out of the market, while others offer no distinctive advantage over their competitors. When companies do not understand their competition or have unrealistic goals, this can and will likely be problematic. So, one of the first steps when talking to prospects is to first understand their goals, in order to determine if an agency relationship is the right fit. There are times when paid search may only be feasible for a business if it is handled by available in-house resources. In this case, a business will want to consider some manner of consultancy or training for the people who will take on the task of managing paid search. Ideally, you will want to find a seasoned resource, but this is not always feasible. And, whether you use an agency or bring an expert into your business, you choice will likely depend on the potential of paid search. This is a hard call, when you don’t yet know if there’s any margin available from paid search efforts. Many markets are crowded and may take months to penetrate effectively. So, how do you decide? You might first hire a consultant to assess your market’s scale, competitive landscape, expected impression share, clicks cost and other factors such as geographical reach and the value propositions your business brings to the market. A qualified agency may be willing to provide you with consultation in such a manner, though you may not find this option readily available in the offerings of many agencies. It certainly doesn’t hurt to inquire. Depending on what you learn from a bit of careful study, you can then move forward with more informed choices about whether or not paid search or PPC should be a priority or a pass. With paid search and PPC you get fine-grained control over geographical targeting, which is essential for businesses such as self-storage facilities where advertising out of range is a huge waste of PPC marketing dollars. This kind of geographical tuning also offers advantages in other ways such as segmentation, landing page content specificity, fraud prevention and general optimization capacity. With SEO, you can’t really target at such an exact level (and are largely dependent on keyword presence and minor optimization techniques such as using schema tags to include geo coordinates with address information and other tactics such as local directory inclusion), but the good news is that SEO does allow you to cast a net as wide as possible. And, the traffic you generate from the overly wide net does not increase your cost. It could, however, make for a bad brand experience when site visitors find out that you can’t provide in their desired locale. SEO simply can’t claim the depth of geo targeting and the width of your marketing reach at the keyword level you can get from paid search. This is largely why paid search and PPC are so successful in situations where you are advertising to potential customers who are truly intent to buy. Paid search can reach these potential buyers in the most consistent, persistent and measurable ways. You might achieve the same with SEO, but only in a limited capacity, unless you are lucky enough to dominate your market in a keyword-pervasive manner. Paid search and banner advertising allow advertisers to select when their ads will be placed in front of potential customers, and can quickly facilitate the presence of any ad at any time. Within a few minutes, you can place a paid search campaign and start seeing clicks. This will not happen as quickly if you are advertising an item or service that is not popular or not yet in the minds of consumers who are searching. Though with clever associations and an understanding of the way your audience searches you can piggyback on other similar products or services. With both banner ads and text ads, advertisers can create sequential messages for potential buyers. These sequential messages can educate, build enticement, offer alternative that may be more fitting or offer complementary products and services. These are only a few of the uses of a sequential messaging approach. Doing any of this with SEO would be a highly strategic, well-executed endeavor that will likely yield marginal results. SEO is not a rapid method of promotion, nor is it equipped with the capacity to sequence a message over time, based on previous exposure. For PR efforts and crisis mitigation among other needs, timing is critical to success. If you need to get a message out quickly or have the chance to beat your market to initial exposure, the ability to engage in rapid deployment is not optional. The value of speed is sometimes the difference between winning and lagging into loss. With paid search your can target much of the entire keyword spectrum for any product type or service area. SEO, while effective at producing higher traffic levels for keyword presence, is not as likely to provide a complete keyword coverage without content that is equally complete, which means that all variations must be covered to the degree that the keyword presence is apt to have algorithmic clearance. Without sufficient keywords available in great variety on well-thought landing pages, SEO is not likely to provide such coverage. This is not to say that these needs will not help a paid search campaign, as they certainly will. However, paid search is not likely to exclude an advertiser’s presence for limited keyword presence. The advertiser may need to pay more for presence in search results in such cases, but if bids are set high enough, there is little to bar entry, with minimal keyword presence established, and in many cases with no substantive keyword presence established. Another factor involving keyword reach is the ability to measure the success of keyword optimization. This has become much more difficult with SEO efforts in the realm of Google, whereas keyword metrics in paid search have remained unfettered. Google claims that keyword data is not collected from organic search results that are shown to logged in users, as they are using secure hypertext transfer protocol once logged into their account and Google is intent to protect their privacy. Google is intent to protect their privacy up to the point where there is willingness to pay for ads that run in Google’s search results and the search results served throughout Google’s network of search partners. If you are using this network, you still have access to the keyword data related to searches — when a user clicks on your ads, as well as when your ad was shown to a user and has registered an impression. Impression data is also available for organic search, but it is provided through Google Webmaster Tools. The accuracy of this data is questionable, due to it’s range-bound estimations of impressions and clicks. To trust this data is perhaps taking leap of faith, as it lacks specificity in such a way as to be suspect. And, it rarely seems to be on the mark. The reality is that Google benefits from removing this data from the organic search mix, as it obfuscates the information SEOs use to improve their placement for specific keyword phrases. If you don’t really know where you rank or how often you appear for various phrases, how can you possibly optimize effectively, with the exception of the keyword phrases that remain available for organic searches. Over time, the number of keywords that have been lost as users cross the http-https divide has increased significantly. This, in many ways, leaves SEO practitioners in the digital dark. Perhaps it’s better to focus on great information than it is to use information to better your chances of surviving as a business. In some cases the information that is created is only possible because the business is able to optimize based on data, so it will surely lead some smaller players in many industries to a more final result in their capacity to sell. In many ways the search results landscape has changed due to these sweeping moves, and this leaves few options for many businesses. Paid search and PPC are always open to those who are willing to put the effort into executing smart campaigns or have the money to roll with something less efficient for the benefit of a long-term visibility while hopefully moving toward a short-term bump in margins — or better yet — profit. For most, this is still a strong possibility, even for law firms, insurance sellers and saturated markets that are fortunate enough to have the margin to work with and the drive to improve qualities scores so they can drive down click costs and produce compelling creative that targets the right audience at the right time. Lately, I’ve found that banners have come a long way. I have even clicked on a few over the past few days. Most are remarketing banners, where I’ve already visited a site and checked out products that the sites then place in creative to show me elsewhere. In some cases I’ve been shown products that were better options for what I was seeking. These ads are particularly compelling, especially if the product photos clearly show a difference or some element that is clearly superior. Amazon is particularly good at this, it would appear. And, there are other retailers where the same is true. Uniqlo is one such example, as is Nespresso. In many ways advertisement on the web has become very sophisticated, in that many ad networks offer the ability to gain access to browsing habits and destination such that they can reach me after I’ve visited a competitor. Amazon seems to know, for instance, that I’ve recently searched elsewhere for a particular category of product and in their section for alternative products, I see other examples of the products I have yet to look for on Amazon in particular. This is both cool and it also has a dark aspect to it, in that it for me, seems to overstep my sense of privacy, as I don’t want Amazon to know everything I look for. There may be a reason I chose to look somewhere other than Amazon. As far as SEO goes, if you don’t know what I’ve searched for, then you can’t do any of the things that I mention above becuause you have little to work with, that gives you access to granular targetting. You might use other behavior methods based on a list of IPs you gather from your servers logs that originates from organic results, but if you don’t know what I was looking for at the point of origination, the best you can do is try to gather any secondary details or hope that some other source has collected enough information to predict what I might be in the market for. Personally, I’ll be more confident if I have the keywords at my disposal. And, if you’re thinking paid search or PPC is bound to fail, you might not know your options as well as you should. SEO grows less certain by the day, while the possibilities elsewhere are expanding. If you want to really be in the market, you need PPC in your arsenal and the soon you started to make the most of your options, the better. Every passing day, your competitors are collecting data and knowledge that you will trail behind. If you are thinking that you can simply select SEO or PPC and gain the same or similar traction from either (or ideally, the “free” traction that many associate with SEO), you will likely find that what you get from each is highly complementary and synergistic in many ways. There is usually only one right choice, and that is to use both SEO and PPC to fuel a solid digital marketing strategy. A well-executed paid search effort might surprise you. Many times, I have managed to help clients gain a completely positive perspective on paid search. And, several of these would tell you that what was once considered a waste is now essential to their business. If you want to find out more, please contact us now at 844.500.LEAP for an audit of your previous efforts in SEO or PPC, or a assessment of your competitive landscape if you haven’t begun your online marketing efforts just yet. Verticle Leap will help you find a good strategy and start your efforts a leap ahead.